The Grid is a highway through post-apocalyptic Central Canada from the U.S. Border to the Northwest Territories. It is the setting of this futuristic dystopian film that lays like a MAD MAX FURY ROAD wannabe. The film unites the crew of the successful WOLFCOP films. Watching SUPERGRID increases ons admiration for FURY RAOD’s director Australian George Miller. The classic is hard to imitate. In SUPERGRID, unlike in Mad Max where every character is tough desperate and angry, every character in SUPERGRID just stands around trying to look tough. They carry lots of weaponry are are not afraid of using them. They spew out mean words with cussing, often threatening each other to no end. The film cents on two estranged brothers, Jesse (Leo Fafard) and Deke (Marshall Williams) who must travel the notorious “Grid” to collect and deliver a mysterious cargo. Deke is the good-looking one while the scruffy Jesse has more anger to contend with. In the middle of the movie, Jesse’s ex girlfriend shows up to help, among the situation more intense. They have failed in the past and they do not like each other. Cliche and no surprises in plotting here! The job is supposed to be their last detail. Why? No real reason is given and one knows that they will always be forced to make another one. As in the case of the story that the brothers have to survive one last run. 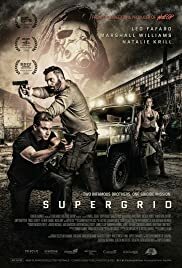 SUPERGRID is quite an intense and serious film for a totally escapist actioner. The script’s only funny parts are Deke’s one-liners and these are the most unfunny one-liners written in an action film this year. One would imagine that at least one of the two script writers T.R. McCauley and Justin Ludwig cold have come up with something remotely funny. Not only does the future look bleak, but one thing after another keeps going wrong for the brothers. The film’s production sets, containing largely of trash, broken walls and sparse landscape are convincing enough. The film aims for a MAD MAX look and the film looks it, being shot in the open sparse plains of Saskatchewan, Canada. The special effects are all right and the action sequences passable. But there are no fantastic panoramic shots of riders or car chases in the vast desert as in the MAD MAX films. The brothers are not told what the cargo they are picking up, not that anyone cares. The brothers also encounter a lot of weird characters at the U.S. Canada border who demands sachets of water. All the apocalyptic events are vaguely explained resulting in a scenario that one can hardly be sure of. SUPERGRID would have resulted in a better film if the filmmakers put in the same effort to connecting the audience to the story and characters as they did in creating the film’s look and atmosphere.